19-year-old Haneen Zreika will make history on Sunday when the Western Sydney local becomes the first Muslim woman to play in the AFL Women’s competition. Also the first woman of Lebanese descent to play in the competition, Zreika’s opening round debut was confirmed by GIANTS AFLW head coach Alan McConnell in a digital media conference on Thursday. Show your support for the GIANTS by becoming an AFL Women’s supporter member. Click here to sign up or renew. McConnell said the teenager’s debut is hard-earned; she didn’t play a game in 2018 as a rookie and was delisted at the end of the season. “She’s had a fabulous preparation,” he said. “She’s done it pretty hard – I delisted her at the end of last season. She had to earn her spot back on the list. 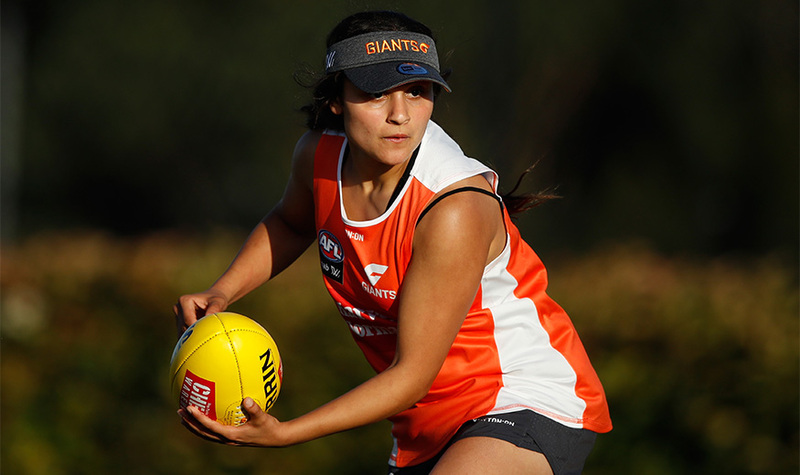 An impressive 2018 Sydney AFL season for the Auburn-Penrith GIANTS saw Zreika re-drafted with pick 66 of the 2018 NAB AFLW Draft and, since being back in GIANTS colours, she has impressed with her running ability and crunching tackles. Holbrook’s Alyce Parker will also make her AFLW debut with the 19-year-old earning a place in the GIANTS’ midfield alongside her former NSW/ACT Under 18s coach Alicia Eva. “It’s been a real journey for Alyce, a young country girl, on the back of completing Year 12,” McConnell said. “While she’s in Sydney and chasing her dream, it’s not been easy for her … but each week since Christmas, I’ve seen her become more and more comfortable in the environment and integrated in the group. Gaelic football star Yvonne Bonner will make her AFLW debut after joining the club as a rookie in September, while forward Christina Bernardi will play in the orange and charcoal for the first time since her trade from Collingwood in June.